As a child, I used to love when the Scholastic Book Orders would go home. I would sit and try to figure out what to ask for. When I had a classroom of my own, it was no different. I would spend a lot of time trying to make an order to supplement my classroom. As the mother of two young boys, I smile each time they come home with an order form. 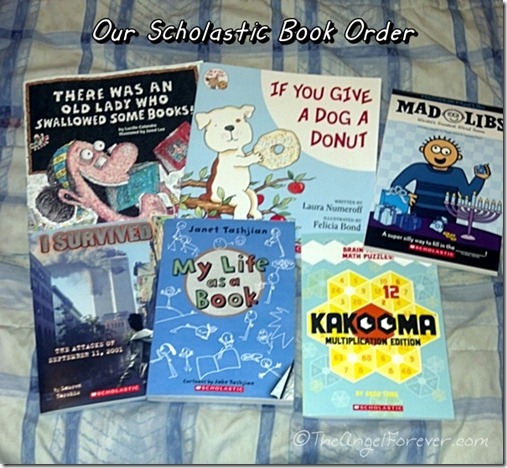 These days, I like Scholastic even more since teachers are able to open up online orders. This means that I can charge my order, earn points for the classroom teacher, and select from even more books. This time around, I ordered a few books for the boys and one that I have been intrigued with. I had been hoping to save them for Chanukah, but that didn’t happen. Now the kids are excited to get a few books at the Scholastic Book Fair. Although I love going to that, there is just something more special about the order forms and helping the teacher out with points. Do you enjoy scanning the Scholastic Book order forms and buying items for your family? I would love to know what you have purchased recently. If you have not bought something from Scholastic, I would love to know what books you are you reading right now? Please be sure to link up to your book posts in the comments below. Include something you read on your own, with a child, or someone else. Tuesday Tales are all about spreading the love for books.